Address: Walsh’s Merrion – Allcare Pharmacy, Merrion Shopping Centre, Merrion Road, Dublin 4. 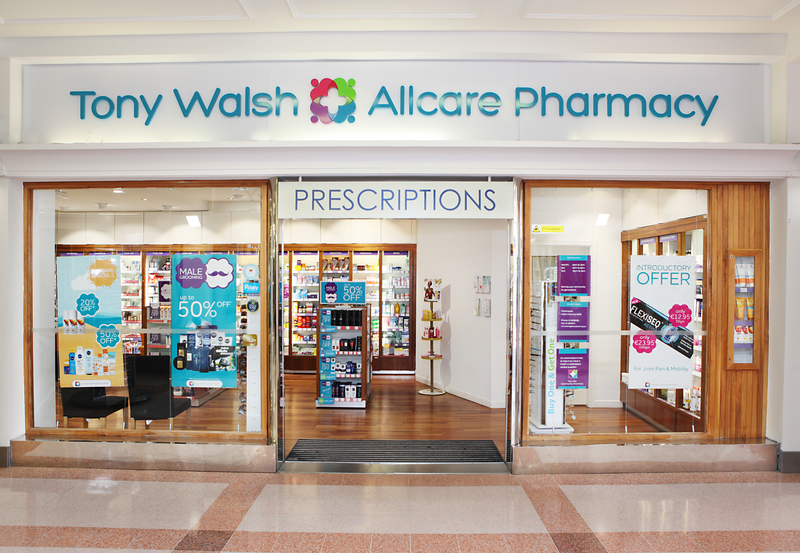 Walsh’s Merrion is an Irish owned pharmacy that has been serving the local community for over twenty-five years. We are situated in the Merrion Shopping Centre opposite St Vincent’s Hospital. In order to offer our customers the best possible range of pharmaceutical, medical and cosmetic products we have designed our store so that it is spread over two units – the pharmacy and the cosmetic hall. The Pharmacy offers a wide range of prescription and over-the-counter medicines, as well as a multitude of vitamins and minerals. We stock a varied selection of first aid, dental and baby products all accompanied with helpful advice from our trained staff. Along with our prescription and OTC portfolios we also offer our customers a myriad of high quality services which include free blood pressure monitoring, a private consultation room where customers can seek confidential advice from our pharmacist, administration of the flu vaccine and up-to-date dietary programs. The Cosmetic Hall is a beauty haven. We carry a vast selection of carefully considered, high-calibre products that cater to every cosmetic need; from hair care to foot care and everything in between. We are proud to stock a huge collection of award-winning, trusted brands including Clarins, Dr. Hauschka, La Roche Posay, Ren, Neostrata, Nuxe, Avene, Green Angel, Crabtree & Evelyn, Mama Mio, Sanctuary, Roger & Gallet, Remington, Nivea, Vichy, Catrice, St.Tropez, Trilogy and Rimmel. We carry assorted gifts for men, women and children all year round to suit any budget. We offer complimentary gift wrapping services and our friendly, approachable and knowledgeable staff are always happy to help fulfill your needs.